Great Hall of the People in Beijing on June 27, 2014. In the aftermath of the 2011 democratic reforms, Naypyidaw decided to get closer to Western countries in a move to cease the economic sanctions that were hurting the Burmese economy for the last decades. Now, obviously being squeezed between two very large, potentially powerful and with the two largest populations in the world, China and India, handling its relationships with them requires some deftness. And, it must be acknowledged that Myanmar’s rulers, particularly the military ones, navigated these tricky waters fairly skillfully. Now, with respect to China, Burma has always harboured a primordial fear of the Middle Kingdom given the long conflictual history of their relations with waves of invasions, and the contemporary assertive, expansionist, revolutionary rhetoric emanating from the new Xi Jinping leadership has made the leaders of the newly independent Burma even more wary of China. In the same context, Myanmar’s newly gained popularity among Western nations has been concerning to China, which had long enjoyed unchallenged influence in the isolated state. Indeed, the promise of democratic reforms may have been partially motivated by also a desire among the country’s leaders to reduce Myanmar’s dependence on China. Thus outreach to the West was accompanied by signs that Myanmar was pushing back against China, including the cancellation of a dam project in northern Myanmar (see below). In addition, China is increasingly unpopular among average citizens in Myanmar, particularly in the border region, and popular opinion will grow increasingly important should democratization continue. China has been responding to these developments not by stepping up its engagement with Myanmar but instead by cutting it back. 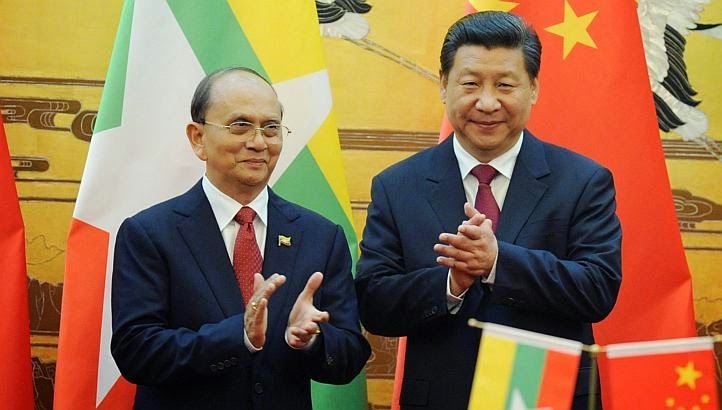 China slashed its direct investments in Myanmar by 90% from 2011 to 2012. Indeed, in the fiscal year ended April 2013, China had pledged $407M in new investments in Myanmar, about a tenth of the $4.3B the year before. Between April 2013 and January this year, Chinese investment in Myanmar was only $46M. Beijing also scaled down the number of high-level visits, even as other countries were expanding bilateral talks. Still, China is the impoverished nation's second-largest trading partner and biggest foreign investor. 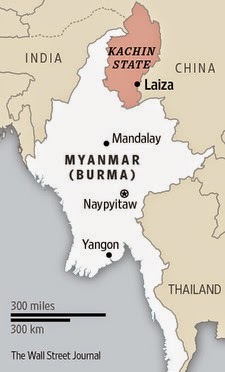 Additionally, in recent years, Burma has moved to develop strategic and commercial relations with India, with which it shares a long land border and the Bay of Bengal. Increasing trade and military cooperation with India and developing bilateral relations with Japan and within the Association of South East Asian Nations (ASEAN) shows a shift in Burma's foreign policy to avoid excessive dependence on China. Bear in mind that when overseas Han Chinese communities are threatened, there are consistently widespread calls for the Chinese government to intervene, and the Kachin, called Jingpo in Mandarin, are one of China's 55 recognized ethnic groups. However, for the time being what may be the most important issue for Chinese leaders is dams. Foreign analysts believe that the goal of Myanmar's campaign is to take control of the sites of proposed hydroelectric dams, unpopular with local people, but important to Chinese state-owned companies. If finished, these dams are planned to send most of their generated power to Yunnan, providing a major source of clean energy to a government that has recently been under considerable pressure to move away from coal. The largest, the Myitsone dam, was canceled in a response to popular pressure as one of the first actions of Myanmar's current reform-leaning president, however China is eager to see work on it resumed. Indeed, China Power Investment Corporation's investment in the $3.6B 'Myitsone' hydropower station on the Irrawaddy River hit a snag in early October 2011 as Burmese government suspended construction due to local residents' concern about the human, environmental impact and perceived benefits. Most of the power generated is expected to be exported to Yunnan province in China and local residents have claimed the lack of community feedback in the planning process. In practice, far from benefiting Burma through flood control, the dam would put the demands of power generation for China before the needs of local people. Chinese engineers running the dams will decide how much water to release downstream according to orders from Beijing. As seen with the Mekong, this can cause unexpected and devastating water surges and shortages. China's government is stating Burma will get $54B in tax revenue, shared profits, free electricity. At stake is China's huge financial stake in the project and also risk to other big projects China has in the country. Now, with Myanmar getting the ASEAN chair, Naypyidaw will likely forge a middle ground amid the conflicting interests that involve the South China Sea. Myanmar has demonstrated a certain determination not to let the South China Sea issue rock the boat this year. However, concomitantly, Burmese leaders have vowed to neither become the next Cambodia (cfr. referring to country's role as the 2012 Asean head, in which it sided with Beijing's position on territorial disputes). As such, Myanmar will aim to maintain unity within the ASEAN and allow aggrieved nations - particularly Vietnam and the Philippines - to lobby for stronger action against China complying with the spirit of the 2002' Code of Conduct in the South China Sea - a declaration signed between Asean and China that set out broad principles for conflict resolution in the waters. But, Myanmar has been placed in an extremely difficult position, and not sure whether the U.S. would really stand-by now that Hillary Clinton is no longer the Secretary of the State (she visited Burma in November–December 2011 being the first Westerner to pay visit to the country). The morale for this line of events is that when a country suddenly no longer bows for China, it will attract a fury and fire in retaliation. This should be a warning for fellow Asian countries when building to deep ties with China, ie. Cambodia, Malaysia, etc.